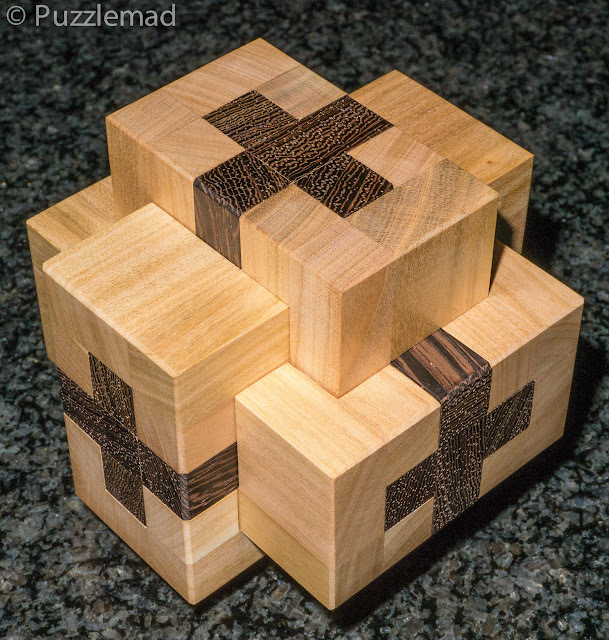 I had seen the Crosscut burr pictured above a long time ago in a Burrtools screenshot when Dan Fast (aka CrazyBadCuber) showed off his new design. I am amazed how quickly he has picked up the skills to design in Burrtools and has produced some absolutely fascinating ideas. A few have already been produced by Eric Fuller and Stephan Baumegger but this is the first to be made by my favourite Czech craftsmen. I got very excited when Jakub showed off one of the first and I immediately sent off an email expressing my interest. I was delighted when it arrived earlier this week and it is just as special in real life as it was on Facebook. As you can see it is absolutely stunning having been made out of Cherry and Wenge. All the edges are beautifully bevelled and all the pieces fit together so perfectly that you cannot feel an edge between them. I received it at the end of a VERY long day and after placating Mrs S about yet another delivery and having a bite to eat, I was too tired to do any more than idly fiddle with it. 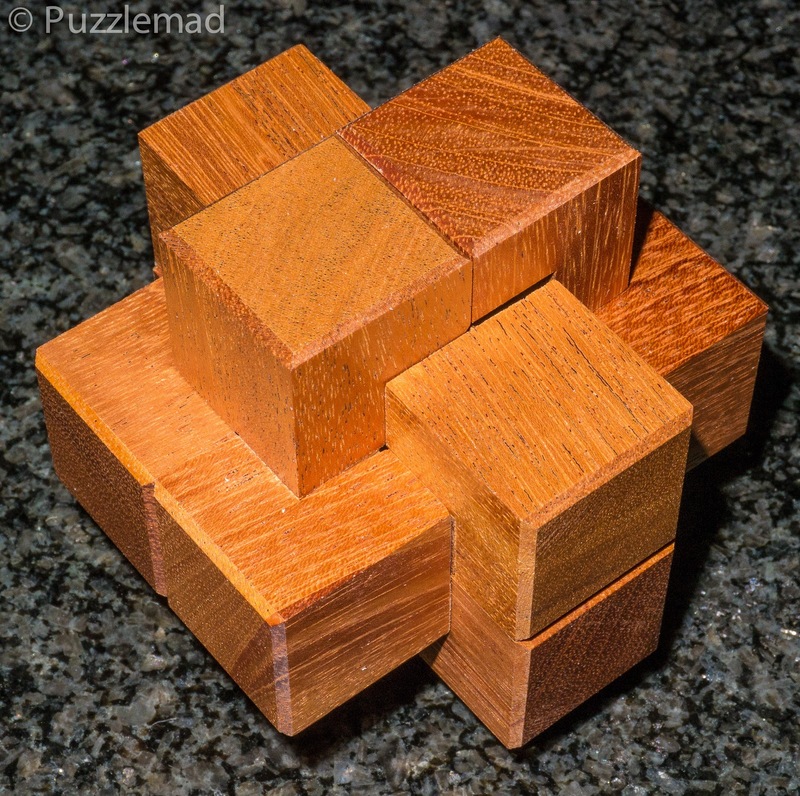 I took a photo and posted it on Facebook and a while later Dan asked whether I had solved it yet - he claimed that it was an easy one! Yeah! Right! He doesn't remember that I am really not terribly bright. After a bit of fiddling around I had noticed that there are a few possible initial moves and thus a few potential dead ends. The following evening I settled down to have a proper go and systematically went through the possible starting moves. Luckily there aren't too many and it didn't take too long to find a pathway into the disassembly. Every single move is as smooth as butter - even when pushing pieces back into place the moves are perfect with no catching. This is achieved by having very fine internal bevels too - it's just a mark of the attention to detail given by Jakub and Jaroslav. After about 10 moves I got stuck - it took me a fair while to find the next move. This was more due to my lack of skills than anything because the design is a beautiful and actually almost a logical sequence. The level is 13.2.1.1.2.2 and once the first piece comes out it is then a matter of just quickly finding the correct sequence to remove the others. Unusually this burr remains stable right up until the last pair of pieces come apart and having kept them all in the order and orientation that they disassembled, I found it an equally fun puzzle to put back together. 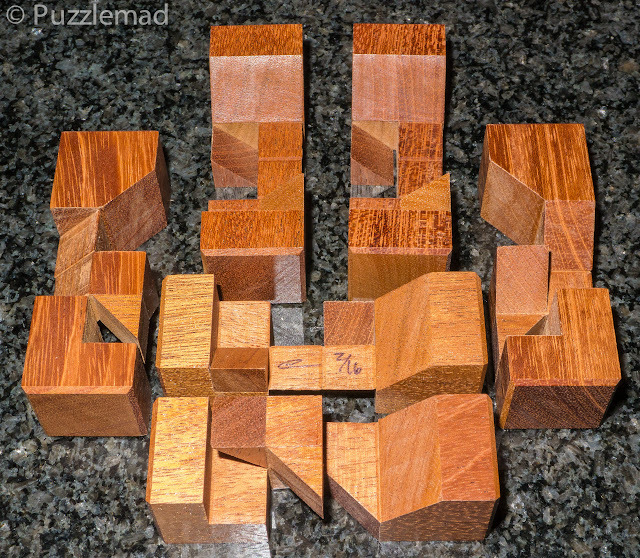 After a couple of goes, I then disassembled it and scrambled the pieces - after that I found that the puzzle was logical enough that I was able to reassemble it with minimal difficulty. This is such a beautiful design and fabulous piece of woodwork that it has become a sort of worry bead for me - it has been sitting on my chair in the living room for most of the week and I just disassemble it and reassemble it repeatedly and find it quite soothing. I know that one or two others (including Dan) have recently received a copy and enjoyed it. It should be up for sale on the Pelikan website very soon. These are all individually numbered and will be only available for a short while - grab them as soon as you see them go up. I'm afraid the wonderful Mimicry that I reviewed a few weeks ago seems to have sold out already. 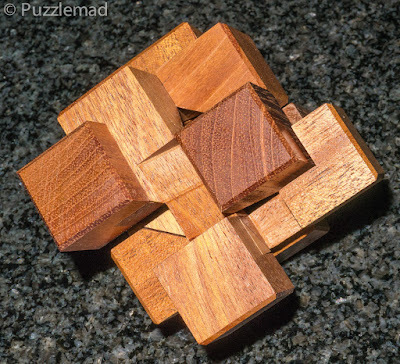 "Transfer is the second of the NOS designs and is simple to disassemble but quite tricky to reassemble. It has a very unique coordinate motion that is absolutely non-intuitive and surprising." Now if Eric says it is "quite tricky to reassemble" then that gives me considerable reason for fear! I already own one of his older coordinate motion burrs (the missing notch) and it took me weeks before I was able to find the dexterity to reassemble it myself! It would have been easier to ask the present wife to assist me but I am far too frightened of the inevitable Whack! Ouch! to risk that! Every piece moves simultaneously and in different directions! Eventually, this week I was running out of new burrs to play with so I thought I had better "man up" and explore it again. As usual I sat in my living room after dinner with a cat on my lap and Mrs S nearby glaring at me thinking that I might be annoying and make jingly noises (gulp!) The movements are amazing! Everything separates and lifts at the same time and the diagonal cuts inside become apparent. In the picture above you can see that I have expanded the puzzle until several of the internal diagonal cuts approximate each other and there is an audible click. At that point the whole structure starts to become very unstable and every time I have chickened out and quickly pushed it back together. Mrs S commented on the fact that I kept doing the same thing over and over again and I retorted that it frightened me to death! After she called me a chicken I just pulled it apart an extra few mm and it went from slightly unstable to surprising the cat! I was left holding 2 pairs of pieces whilst the third dropped on the poor unsuspecting cat. At that point it is possible to see the amazing construction inside and marvel at Eric's skills. 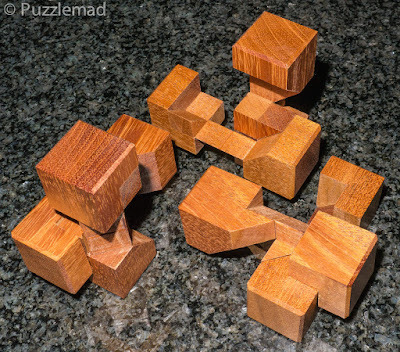 I wondered why the pairs didn't just fall apart and on examination realised that they were linked very precisely. The pairs actually needed to be separated deliberately from each other. 2 identical piece types - just look at those cuts! At this point it became apparent that there are 2 piece types arranged in pairs. I was very worried that I wouldn't be able to put it back together but the logic of arranging the pieces is not at all difficult and I was delighted to see that Eric has given just enough play in the piece arrangement that they can be reassembled with only a little dexterity - only one pair of hands is needed.....thank goodness. This one has also become another worry bead for me this week - the dis- and re-assembly are a lovely fun movement and quite soothing for me. I really hope that Eric has second thoughts and makes the others in the series - they do look quite complex but surely, if anyone can do it then Eric is the man? It's well worth your while grabbing that last copy from the Cubic dissection site and whilst you're at it pick up the last copy of Crenel too. Don't tell Mrs S but there might be a few more parcels on their way over just now. Whack! Ouch! Too late - she was watching over my shoulder - who'd have thought someone so dangerous could be so quiet on their feet? Whack! Ouch! Sorry dear!